The ship sinks in the silence of the Night Sky. There was only one person on board, he was the captain. The ship, whose magnificent boards of wood and timbers had seen the world several times, were creaking and longing for separation. The captain had surely maddened under the strain of those noisy wooden joints groaning in the heat of an exasperated Sun, and then in the winds and stillness of many a starry night. What went through the captains’ mind when he realised that his journey was soon to be over? Did he have any regrets? Did he even remember where he was going? He was not an old man. He was in fact young, in his prime, in between thirty and forty years of age, strong, healthy, fit, and he possessed the strength of mind, agility, and of course, that thing that distinguishes an average sea man, from one that gets written about in books and turned into myth; he possessed that magical quality, Ability in the Abstract. Like the characters of myth he was a of a tall, slightly thin, wiry but strong build, and appeared in the docks and ports more like a shadow than a man. The proof of his existence was not really in himself, not in anything that he made, did or touched, for just as a shadow can’t have any convulsive effect on the world, he was indistinguishable form. The only evidence of his existence was in the whispered of fellow labourers, of workmen whose lives he managed to affect without even being in real contact with. On this solemn night in the stillness of the ocean, the ship mysteriously took on water, and with no crew on board there was no-one who was at hand who could man the pumping equipment. There was no-one and the ship slid, like a pebble through the gleaming mirror like sea into the warmth of the silence beneath, into the motherly womb of the ocean floor. Was there any chance of that lost soul ever getting out alive? With no other ships for a hundred nautical miles, with dangers such as currents to pull you under, creatures of the deep like sharks, immense whales, deadly and poisonous jellyfish, and the fear of dark and foreboding death in open waters, how could anyone possibly survive? No, it was certain doom, and the man in charge of his man-less vessel fully well knew it, despite the fact that his senses seemed altogether distracted by something. His death was certain, and we must not dwell on it anymore. What is of interest however, is the man’s zeal. His motivation. How did he end up alone on a medium sized caravel which ordinarily would require at the very least twenty strong and able bodied crew? Alone, cast in the ocean was this lone anti-hero of a man, with seemingly no direction, and no compass, only the stars in the night time and the Sun’s path along that imaginary line called the ecliptic. How did he come to be there, with not another soul for company, with no thought, with no place to pin anything or anyone down on? What was his cargo? 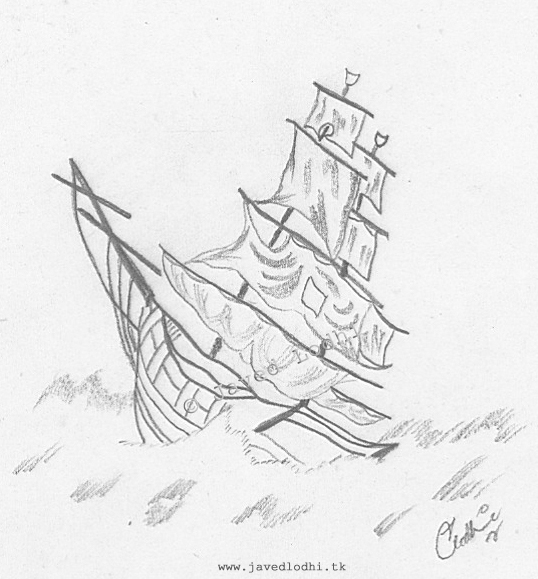 Was the ship empty, distracted and unflinching, unable to let go of some unfathomable thought like its unhappy captain? Some disaster my have stuck its crew, or some mutiny, some form of plague swept it or some catastrophe wiping out those men? And how did he end up in that place at that time of the night and in those terrible circumstances? And what, or who was he thinking of? There was a tiny portrait of a woman in an equally miniature medallion made of silver hanging from a chain tight around his neck, tucked just below the shirt collar. Did he think of this girl, this child-woman, as the water enveloped his body and threatened its suffocating grip on his easy breathing lungs?